This is the kit I started in college. 15 years later I finally finished it. I think it started back in my first year of college. I was sitting in the lounge area of the dorm and had just gotten a couple of crochet afghan kits in the mail. One of the basketball players (it was a very small community college) asked me to teach him how to crochet. He had watched me doing it and figured it was probably easy. I sold him one of the kits and we got started on it. I don’t know if he ever finished. I only remember this incident because I wrote about it in my journal. 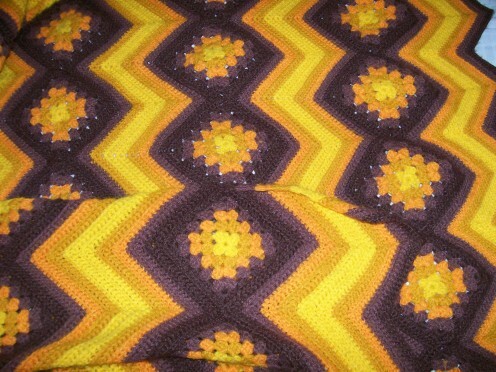 I still have the brown/yellow/orange afghan that was the first kit, and I wrote that the second kit was in blues. I had another odd job from a lady who had a dog. She wanted a dog sweater in the school colors red and white (from another school, not any of mine) for wearing to their football games. 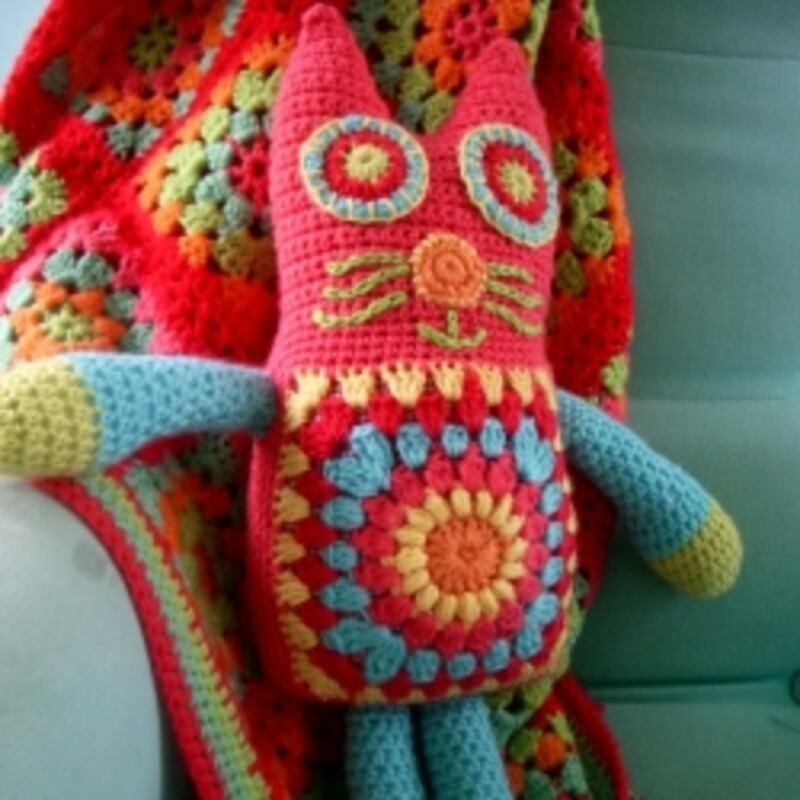 This was a hard one as I had no patterns (and this was way before the internet) so I had to create a blanket/coat in crochet from the measurements she gave me. I didn’t have a dog to try it on, so I used my cat. When I put the sweater on him, he promptly fall over (it’s a cat thing). I tried to get him to stand up in it so I could see the fit, but he didn’t cooperate. I got paid for that sweater but didn’t ever hear if it fit or not. Never agree on a price until you see it first. Another job I had was after attending a national home economics conference with a former home ec teacher and her daughter, as well as another former home ec teacher who lived in my town. She saw that I liked to do embroidery and other handcrafts. She asked me if she mailed me a big embroidered picture she had started but was in need of finishing, would I take the job? I had no idea what it looked like, but being I was between jobs and school I had time to work on it. She mailed it to me and I was a bit overwhelmed at how much needed to be done. It was a pretty design in whites, off-whites, and golds. I spent a lot of hours working on it and more than earned the $20.00 we had agreed on at the conference. Tablecloths can be big jobs. Another embroidery job came from a local person who was a friend of a friend. Sometimes people call members of the Casper Needle Guild to find someone to finish up some embroidery project that they can’t do any more or inherited and have no idea what to do. I agreed to work on it but this time setting my own price instead of a pre-work agreement price. It was a huge tablecloth that needed a lot of embroidery done. Even though the design was stamped on the fabric in blue, it was still a lot of cross stitches and other simple stitches. I was also asked to finish crocheting an edging for a tablecloth and that was a big job, too. I don’t think it was the same person, but it was back in the 1980s so I don’t remember all the details. I made some crocheted doilies for my self and my family. Then I decided to make a few for a church bazaar and bake sale. One of the ones purchased by a church member was only on the condition that I make a second one for her of the same as she wanted to put it on two end tables under the lamps. I made her second matching one, and delivered it. She wanted to pay the same price as she did at the bazaar but I had to ask for more since I was not donating my time on this one. She had planned to ask me for more doilies but changed her mind when she found out what I charged for the work. I didn’t mind as I was working full time and just doing my crocheting for fun. Also, it is easier to work on thread crochet in the summer when there’s more daylight in the evenings. It was getting closer to winter and the time change so it was harder to see the darker threads when crocheting doilies in the evening. I took a couple of doilies to work to show my friends what I had been working on, since we had talked about it but they did not crochet and didn’t know what I was talking about. A couple of the ladies wanted me to make them doilies and asked how much I would charge for them. I set a price and started working on the doilies. When they were delivered I then had a request from my supervisor about making several small doilies in blues and greens for her. I was getting so many requests that I enlisted my sister to help crochet the smaller ones. After I went to deliver these small doilies the supervisor looked them over and decided that she did not want all of them for the price we asked for them and only took a few leaving me with two. Then another co-worker invited me to her home to see her antiques as she had a particular doily style in mind to go with them. She described what she wanted, and I had no patterns to fit the description (remember, this was all before the internet so no search engines to look for what she wanted). I also quoted her a very high price for such an elaborate design and large size. She decided that it would not be worth it, so I got out of that job. With a side of tutoring. 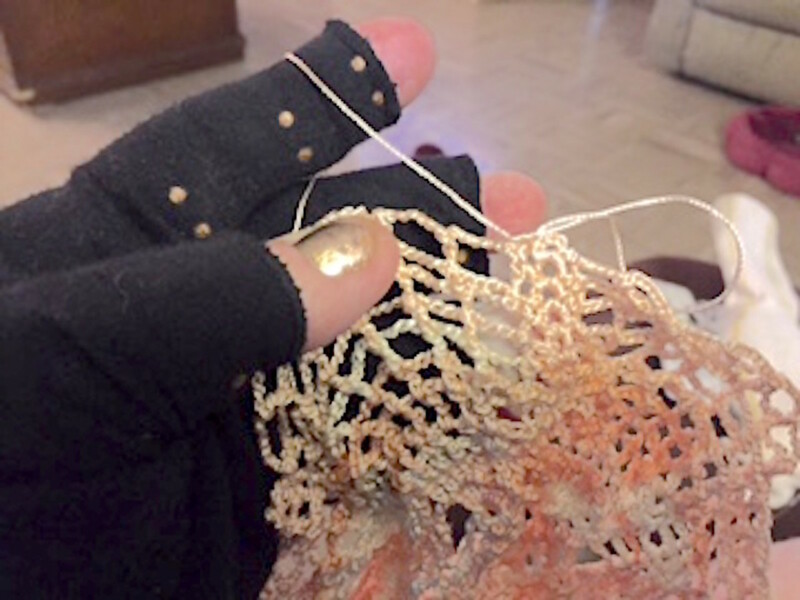 I also had the occasional private lessons for tatting or crochet. The elderly woman down the street from me, through her daughter-in-law, was looking for someone to refresh her memory on how to tat. She had done it as a young girl but had forgotten most of it and wanted a tutor. I did it for free, and in exchange she taught me how to do a pair of knit slippers with a unique waffle stitch. She would call me after work to come down to see her, and I think it eventually was because she was lonely and not that she needed help with her tatting. I finally had to tell her I was busy and didn’t have the time to drop by anymore. This visits usually lasted 2-3 hours, so I was neglecting my chores at home in order to help her and my parents asked me to stop going. I had a student in my beginning knitting/crochet class who had to miss a few classes. She paid me to come to tutor her at her home. I asked $10.00 per hour for tutoring. She just needed a couple of hours and then that job was done. I have offered to teach people but haven’t had a lot of requests. 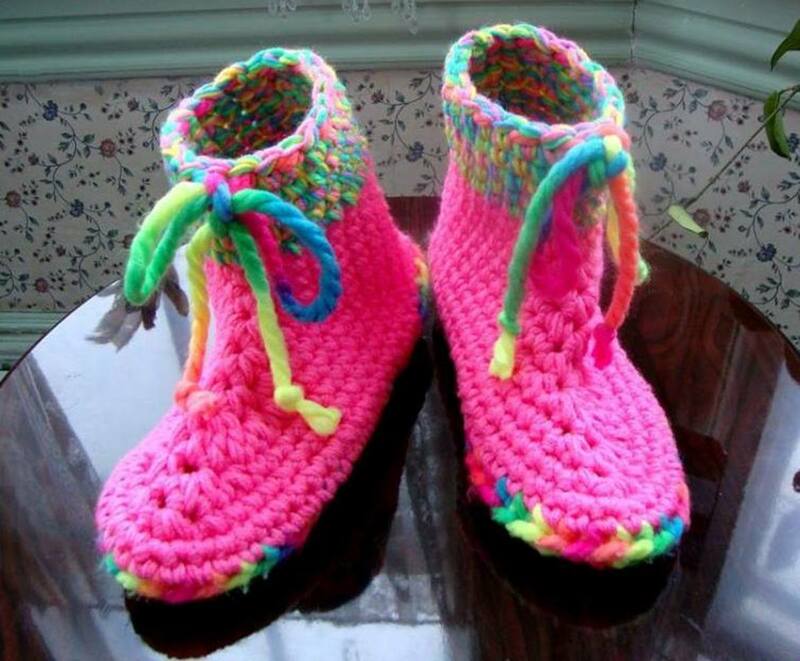 One lady called from an assisted living complex to ask me to teach her to crochet. Then she called back and said not to bother as the complex had classes that met on Thursdays so she was getting her crochet lessons there. I have made samples of various items for teaching the beginning knitting and crochet classes. I tried to make one of each pattern that I handed out in my classes. That way the students could see what the finished product looked like and what size it should be when completed. 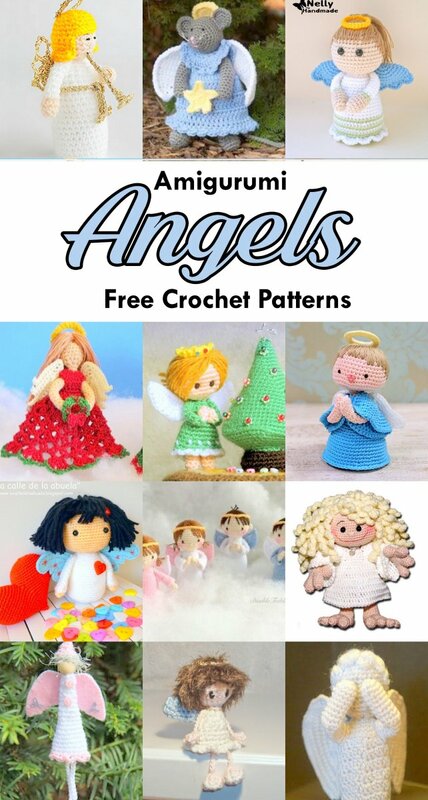 Some I have the finished samples and can’t make more or use the patterns as they are out of style or require materials that are no longer available. I made items like a pocket tissue holder or ring-hotpad from pop rings off six packs (they don't make them like they once did), and some I can’t get the supplies for like the crochet covered wooden hangers (they don't make the single bar wood hangers anymore, I've searched and searched but they have been gone for about 10 years now). 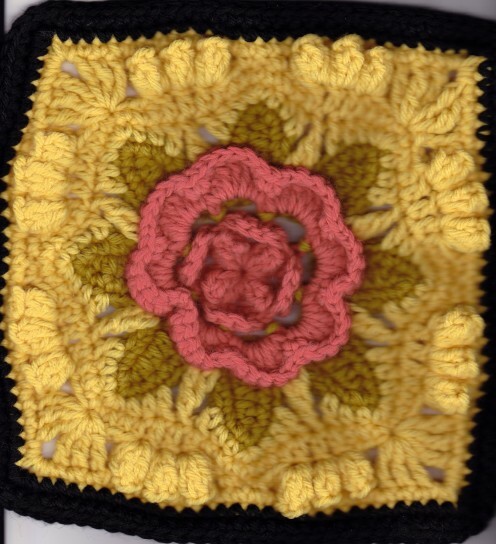 Some parts were incorporated into other items, like the sampler squares for the afghan session I taught only one time. Even leftover squares from other afghans that I made too many squares for, because I didn't know how many I'd need (out of 300), become a focal point in a different afghan. I still make my “crochet critters” pencil toppers (see my other blog All That Yarn - Using Little Yarn Leftovers for the pattern) every year for Halloween treats. I make scarves or pillows or other items for my friends at Christmas time. I used to crochet tiny snowflakes to send with my Christmas cards to my friends. I also did tatted ornaments for them all one year. A few have even gotten “cards” with an inserted Hardanger embroidery piece. I also make a lot of afghans to donate. So if I don’t have a job, I still have a “job” with things to make for others. At the Casper Needle Guild we sometimes had mini-sessions where one person who knew a lot about a stitch taught it to others in the guild. Sort of like mini workshops to learn a new stitch. I offered to do one on tatting as there was a lot of interest in learning that work. I think I had about fiver or six people come to my house for an afternoon. None of them kept at it as most had other needlework interests to pursue and just wanted to learn how to tat without planning to continue doing it. The church hasn’t had a bazaar in years, but they still have a bake sale (and I’m not a baker so I don’t help out). The former co-workers who wanted doilies have long since moved on to other jobs or retired. With the internet, people can find things to buy or patterns for things they want to make, and I don’t have to invent patterns for them. And I don’t have to make it for them either. 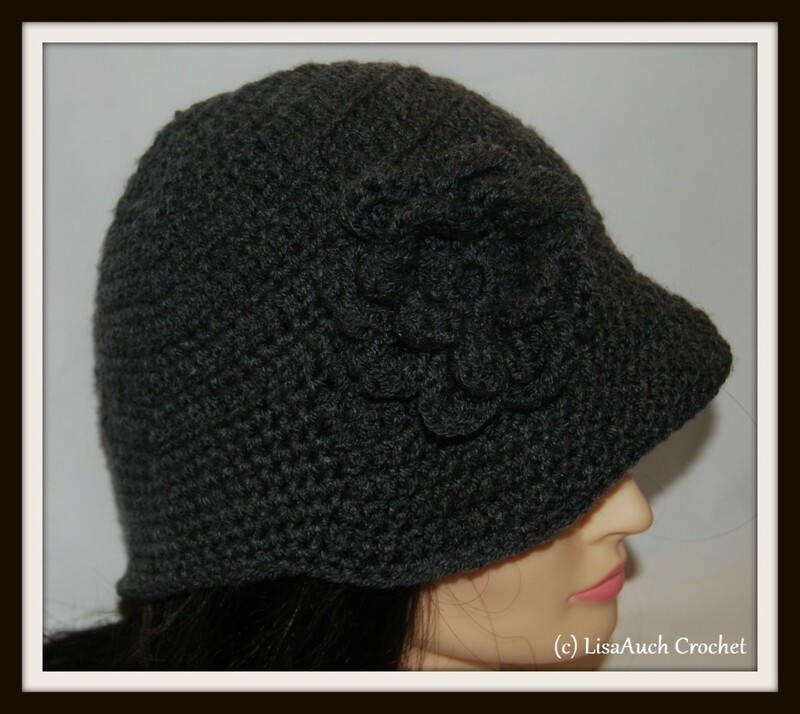 I’ve had a lot of odd jobs dealing with my skills in crochet, knitting, and others. Some paid and some for free, but all were interesting and definitely a learning experience.